For attorneys looking for a fast, cost-effective ADR process, consider utilizing the expertise of JAMS panelists as general, special or discovery referees, or as temporary judges. To help you get started, please find below clause and stipulation forms from The Rutter Group. Parties select the decision-maker and determine the capacity in which he or she will serve, from deciding discrete issues to managing discovery, holding a full bench trial and handling post-settlement allocation. Parties may also choose whether the process is binding or recommended. Our neutrals can offer early, reliable hearing dates and are readily accessible to quickly review briefs and hear motions. Temporary judges and referees operate under established rules of evidence and the right of appeal is preserved. Our retired judges and attorney-neutrals have decades of trial and ADR experience in virtually every practice area—and they're supported by unmatched case management and a network of convenient, spacious hearing facilities. Include a clause in your contracts or file a stipulation with the court providing for a JAMS neutral to serve as a temporary judge (Cal. Const. Art. 6, § 21) or as a consensual or all-purpose referee (CCP § 638). Parties typically retain a temporary judge to decide the entire dispute, but they may also choose a temporary judge or referee from JAMS to make determinations on discrete issues. Our panel features knowledgeable discovery referees with vast subject matter expertise, including e-discovery and technology. JAMS referees devise and manage discovery plans and supervise ongoing issues, including monitoring depositions and resolving discovery disputes. Our e-discovery referees determine what electronically-stored information (ESI) is reasonably accessible or recoverable and rule on questions such as search parameters, native formats, disclosure of meta data and determinations about technology assisted review (TAR). 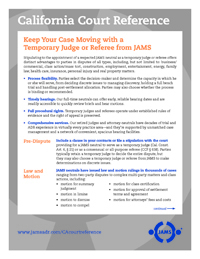 JAMS appellate referees can review an initial evidentiary record and recommend a final decision in an appellate hearing. View a copy of JAMS CLE Menu, which features programs on the use of special masters and discovery referees, or contact us to customize a CLE on the use of court references and temporary judges.